OUR WORKSHOP WENT GREAT. THANKS TO ALL PARTICIPANTS! What if you could experience everything you love in life all at once? Sound overwhelming? Yahoo! Wellness Expert David Romanelli will show you how a 2 hour vinyasa flow yoga class pairs beautifully with Bob Marley, exotic Vosges Chocolate, fine wine, and one unforgettable Savasana. 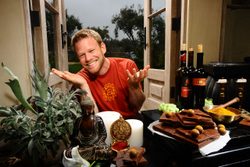 For several years and in studios near and far, David Romanelli has been teaching the Yoga + Chocolate and Yoga + Wine experiences. His work has been featured in the New York Times, O Magazine, and Newsweek. He seeks to share how everyday passions, embraced mindfully, are gateways to the present moment. 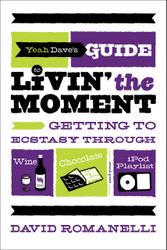 With the debut of his book Yeah Dave’s Guide to Livin’ the Moment (Broadway Books), David is launching a new wave of yoga, chocolate, wine, and music-inspired ecstasy. Celebrating the launch of his debut book, this will be a party you will not want to miss. David will teach a 90 minute vinyasa flow yoga class set to great music (ranging from the Grateful Dead to Frank Sinatra). The class will focus on the message of simple pleasures. Even if the economy is rough, we can always indulge in a nice Cabernet and some classic Jerry Garcia. But there is an art to quieting the mind and letting in the beauty, and this class will emphasize the powerful rewards of investing in time to enjoy. After class, while you are indulging in a feast of tasty treats and fine wines, David will read from his newly released book. It will be an evening of culinary, cerebral, and spiritual ecstasy. Do you remember what you did a week ago Thursday? What about two weeks ago Wednesday? With all the chaos and information of the modern day, our lives are becoming one big blur. It's harder and harder to find a moment of solace and pleasure. David has a powerful solution. Everyday of your life, enjoy one beautiful moment, one funny moment, and one delicious moment. You’ll soon discover that a meaningful day is no farther than a waft of lavender, a taste of the perfect olive, and a good, hard (if not sidesplitting) laugh. After a fun, flowing 90 minute yoga class, you'll enjoy exotic olives and cheeses from the far corners of the world. The science states that in a relaxed state, the chemistry of your saliva changes and all flavor is enhanced. The apres-yoga treats suggest a deeper metaphor: Everything is better when experienced in the moment! "Anxiety is a thin stream of fear trickling through the mind. If encouraged, it cuts a channel into which all other thoughts are drained." - Arthur Somers Roche. With all the chaos of the economy, who hasn’t felt fear rear its ugly head over the past few months? Are you sick of fear’s effects on your mind and body? Anxiety, nervousness, sleep loss. Who needs it! In this 1 hour vinyasa flow/1 hour deep stretch class, David will touch upon fear and all the ways it impacts the human experience. Without creative rituals and colorful analogies by which to perceive fear, it’s a lifelong battle. At the end of class, to toast your newfound freedom from doubt, insecurity, and negativity, David will lead you through a tasting of seven exotic Vosges Haut-Chocolat exotic truffles. There's no better way to live large in challenging times than some relaxing yoga, good tunes, and rich, deep, milky, amazing chocolate! RESERVE YOUR SPACE - This workshop will sell out fast, so book it early! Please print out your receipt and bring it to the workshop. That will be your admission ticket. PURCHASE THE THREE DAY WORKSHOP AND GET A DISCOUNT! To purchase ANY TWO DAYS ($110.00) click the button below. A copy of your receipt will grant admission ANY two days. Specifying which days is not necessary. To purchase ANY SINGLE DAY ($55.00), click the button below. A copy of your receipt will grant admission Friday, Saturday or Sunday. Specifying which single day is not necessary. If we cancel a workshop, you will get a full refund. If you cancel your attendance at our workshop, there will be no refunds unless there is a waiting list and we are able to completely replace your attendance. Any refunds issued will be minus 25% office fees.